Spinal Decompression is used to create a distractive force to relieve pressure on the nerve roots by taking pressure off the discs and joints therefore enhancing the natural healing process by increasing circulation, increasing mobility, and decreasing inflammation. The device we use is called the Chattanooga Triton DTS traction system. This procedure is becoming widely regarded as an effective approach to treating disc problems, spinal stenosis, disc degeneration, and sciatica. During the session, the patient will experience several cycles of stretch and relaxation. Many individuals benefit greatly with a few sessions. 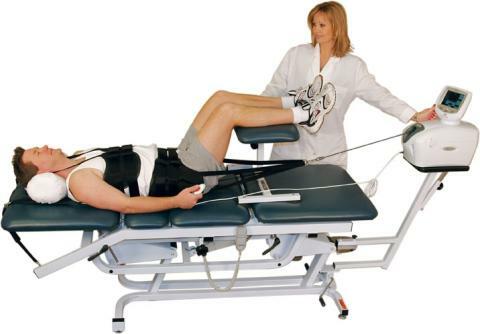 This procedure can also be used for maintenance of non-disc conditions for generalized stretching. DTS Therapy is a leading non-surgical alternative to surgery. You may have relief of chronic debilitating low back or neck pain, which may shoot pain into the legs, buttocks and arms. The DTS Therapy is helping thousands of people, who just like you, thought they would never eliminate the pain associated with simple tasks, such as getting out of a chair or up and out of bed. No drugs are involved and no serious side effects have been reported with DTS Therapy.